Nine in 10 pet owners know when their dog or cat is due for their shots. Eight in 10 women know the frequency with which they get manicures and pedicures. 80% of men know the mileage between old changes. But only 50% of family health care decision makers know their blood pressure, and only 20% know their biometric numbers like cholesterol and BMI. 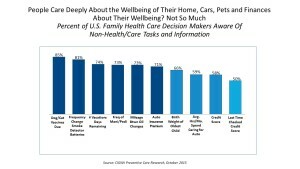 Americans are great at doing preventive care for their pets and automobiles; but not so much for their own bodies and health, finds the report CIGNA Preventive Care Research, a survey of 1,000 U.S. consumers between 25 and 75 years of age who have health insurance and are the health care decision makers for their families. The survey was conducted in September 2015. Only 45% of people know an annual check-up costs nothing for people who carry health insurance. 50% remember their college GPA. 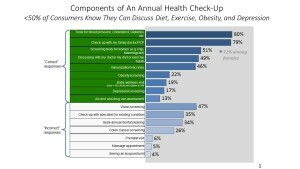 Still, most people believe that an annual check-up “now” can help save money “later,” and that annual check-ups include appointments, tests and “steps you take to stay healthy.” 80% of people also say they know how to improve their numbers related to blood pressure, BMI and cholesterol. Health Populi’s Hot Points: We see a health plan literacy gap in CIGNA’s data: a plurality of health plan members don’t realize that, even with insurance, they are subject to zero co-pay or cost for an annual preventive care visit. That visit includes the check-up, as well as other components as the consumer demands: shots (say, a shingle vaccine for an older person, or a flu shot for everyone in flu season); counseling about alcohol, substances, as well as counseling for obesity; and depression screening. Given the rising levels of stress and peoples’ growing addiction to pain medications, these health plan benefits could be well-utilized among patients — but peoples’ concerns about having to pay for a wellness visit is, ironically, making them sick. Well, at least Americans have healthy pets and well-oiled cars.